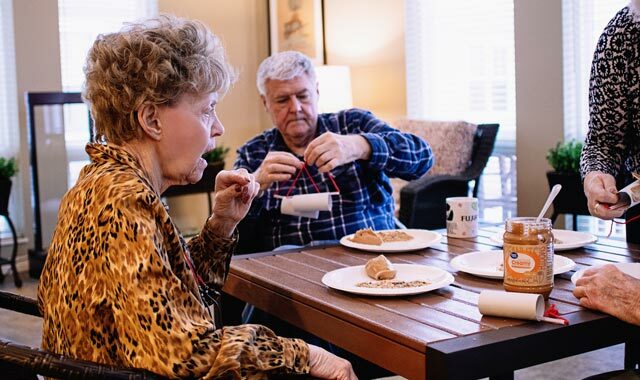 An estimated 5.7 million people are living with dementia, yet few know how to handle the challenges that come along with it. White Oaks, in McHenry, provides care for dementia patients and resources for their families. Residents of White Oaks at McHenry enjoy numerous activities during their days, including craft projects like these homemade bird feeders. Seven years ago, Kim Ribar’s mother was diagnosed with Parkinson’s Disease. Four years later, it became Parkinson’s with dementia. And over the past two years, the dementia has become more severe. All during that time, Ribar – along with her father – willingly took on the responsibilities of caring for her mother. But when her father suffered several major health issues, Kim knew she couldn’t care for her mom and dad and still run her business. That decision was a move to White Oaks, a new community in McHenry designed to serve older adults with Alzheimer’s disease or related dementia. Ribar knew about White Oaks because of her friend Kelly Raske, who is the facility’s director of marketing. Ribar moved her mom into White Oaks in November 2017 and hasn’t regretted the decision. That’s the goal of White Oaks, which opened last October at 4605 West Crystal Lake Road, next to the Heritage Woods of McHenry assisted living community. An estimated 5.7 million people are living with dementia. Yet there are few who know how to deal with it – or who want to – especially older adults. Lynn Graham and her husband knew they had to ask for help. Lynn’s mom had been living with them, but last summer she started getting confused and couldn’t be left alone for long stretches. The decision to go to White Oaks was an easy one. It was within three minutes of Graham’s home. “I chose it because it was brand new and close by,” she says. But it’s more than proximity that assures Graham she made the right choice. “What I really like is that it’s very spacious,” she says. “My mom likes to walk and there’s plenty of room for her to walk around. The rooms are very nice, and there are plenty of places to visit so you don’t have to sit with other people while visiting. “And the staff is wonderful,” she adds. “They have been very good to my mom. Every resident has different needs, and I know they meet my mom’s needs. What makes White Oaks special is the quality of its personnel. The entire staff is trained to handle dementia patients, with some gaining additional, specialized training. And the training is continuous. But there is more to a dementia care facility than knowing how to deal with residents. A good doctor not only knows how to handle sickness and disease; he also needs a good bedside manner. White Oaks is no different. White Oaks does this by getting to know the residents and their loved ones. And that type of care is critical, since there are different levels of need. “Some are in the very early stages of dementia,” Raske says. “You can’t tell they have cognitive changes. But after you talk with them for 15 minutes, you notice things. So, we want to keep them happy and engaged. And White Oaks is there not only for the dementia sufferers, but also for their families, especially at the beginning stages. Ribar can personally vouch for that home-away-from-home atmosphere. Tours of White Oaks are available on both weekdays and weekends by calling (815) 344-2970 any time. Phones are staffed 24 hours a day, seven days a week. This entry was posted on Tuesday, May 1st, 2018 at 11:59 am	and is filed under Health & Fitness. You can follow any responses to this entry through the RSS 2.0 feed. Both comments and pings are currently closed.